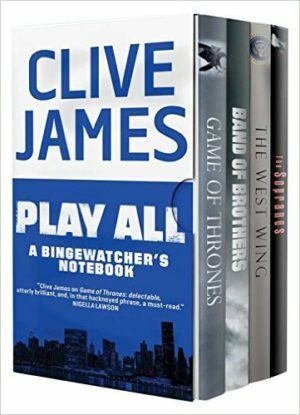 Play All: A Bingewatcher’s Notebook is an interesting book. Staring at the cover confuses me, but I guess that’s a good thing. Before I got the book in hand, I wondered if it was actually a box, but it’s not. Also, it’s not really a notebook. I suppose it might be the author Clive James’ notebook, though it’s not just notes about television shows. This is a book of critical essays about television, written during the time that he was laid up during a long illness. James discusses the role of women, writers, and actors within successful television shows. My interest was piqued because I do love to binge watch, and I especially love the West Wing, which was given a fair amount of coverage. He seems to be a genuine Sorkin fan, and the show comes up in comparison to others, but it mentioning a theme or style or even an actor. I had hoped to get some insight into what I should watch next (I’ve been hesitating on Breaking Bad), but unfortunately, when he writes about the show, he assumes you — like he — has already binge-watched, and writes without regard to spoilers. This is good if you are reading as a fan of a show, but bad if you are going to watch. So I skimmed some of the sections which talked about shows that I plan to watch, instead of having it spoiled. Many of these shows — like West Wing — have major plot elements that are revealed and obviously best to discover on your own. The book feels slightly dated, starting with the title and the idea of bingewatching box sets and the “play all” option to watch more than one episode (on the DVD — as I did as I watched 24 with my weekly Netflix deliveries ten years ago), since most people elect to stream over playing discs these days. Also, when mentioning Allison Janney (CJ Cregg on the West Wing), he talks about her work, but with no mention of her critically recognized work on Mom, a sitcom in its second season. That said, it was still an enjoyable read, confirming some series I want to give a try, and helping me to remember or further evaluate why I enjoy those I do.